Remember that tree house you had when you were a kid? How you spent long summer evenings perched up there reading comic books and hanging out with friends? One of the greatest things about summer is the nostalgia it brings up for us. Each year, we remember the “good old days” and laugh with friends, eat good food, spend lots of time outside, and travel to new and exciting places. It’s just a feel-good time of year. 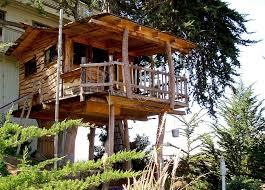 Want to relive your childhood treehouse on your next vacation? Now you can. On the far reaches of the East coast of Canada is a small island called Cape Breton Island (it’s located in the province of Nova Scotia). Last year, Parks Canada introduced tree pods that are expertly hung in large trees throughout the Cape Breton Highlands National Park. Guests to the park can rent these tree pods to spend a night sleeping closer to the stars, and farther from the ground. These “cocoons”, as they are called, are accessible by a long staircase and need to be booked in advance. You better believe these cocoons were very popular at their launch, and are still a fun feature of the beautiful national park. This year, Canada turns 150 years old. And Parks Canada has introduced free admission to all the parks across Canada. That means you get into the beautiful Cape Breton Highlands National Park without paying any admission fees – but you’ll still need to pay to camp or stay overnight at one of the well-groomed campsites, or to rent one of the new cocoon pods. Booking a stay one of the cocoon’s is an affordable $70 Canadian dollars, but given that access to the park is free, it’s quite the deal! From your cocoon campsite, located approximately 20 feet from the ground, you can set out and experience one of the most beautiful scenic drives in the world, bountiful fishing, memorable hikes and unique shopping destinations. People come from all over the world to the little island, and many say it was their favorite place to visit.